In the next decade, NASA aims to launch humankind toward the moon and on to Mars—a monumental step in crewed space travel. Such a journey is filled with challenges and perils, not unlike those faced by the first explorers to cross the ocean. However, instead of stormy seas, these explorers will set sail amid the hazards of the heliosphere—the magnetic environment emanating out from the sun and encompassing the solar system. The risks of travelling through this realm ultimately ride on how well we can understand the dynamics therein. "In order to get to Mars, spacecraft and humans will be immersed in the heliosphere and will have to contend with it," said Terry Onsager, program scientist at NASA Headquarters in Washington, D.C. "That environment can be a harsh one, but one we're ready for." To safely navigate the heliosphere, NASA scientists and missions have been mapping the region for decades. Recent results, from near-Earth to far across the solar system, are helping us engineer a safe path for future space explorers abroad. As astronauts leave the protective magnetic bubble around Earth—the magnetosphere—they become exposed to damaging energetic particle radiation from the sun. Continually streaming out from the solar surface, these solar energetic particles, as they are known, can reach levels that can damage electronics and harm living tissue in space. "Periodically, solar eruptions on the sun's surface can generate enormous increases in the energetic particle radiation environments, and when that occurs, systems need to be able to handle that," Onsager said. Spacecraft are being designed with radiation-hardened equipment and safe areas for the astronauts to hide during solar storms—which can last hours to days. In addition to these protective securities, having a reliable warning system is paramount to astronaut safety. NASA's Solar Dynamics Observatory—SDO—has kept constant vigil on the sun for eight years. The images it takes in visible and ultraviolet light allow scientists to continually monitor surface conditions and understand what activity might be roiling just below, ready to emerge. Once an eruption is seen on the sun's surface, astronauts can typically be given about a half-hour advance warning before the incoming radiation reaches peak levels. While this provides astronauts with some time to take action, ultimately improvements in space weather forecasting are needed to provide more advanced warning. Predicting space weather—the billowing solar wind and solar energetic particles it carries—is not unlike terrestrial weather forecasting. It starts with observing the sun—which SDO and other NASA heliophysics missions do around the clock. Data about the sun's activity is then fed into physics-based computer models that make statistical predictions about the probability of a solar eruption. This then allows scientists to give warning when such an event may occur. "Forecasting space weather phenomena, whether at Earth or in deep space, is very, very complex," said Jingnan Guo, heliophysicist at the University of Kiel in Germany. "We have to consider scales from the sun-Earth distance—about 93 million miles, at which waves and erupted material propagate across space—to below a few meters, at which scale you see the turbulence and kinematics of the particles." As of now, our understanding of the complex dynamics at play in the heliosphere is incomplete, making predictions difficult; the best models are still in the early stages of development. Scientists who model space weather depend on NASA's many heliophysics missions to improve their forecasts. "If you have just a single point observation, it's very hard to model or even, sometimes, interpret the data. If you have multiple points, than you can constrain your model and make sure the underlying theories are capable of reproducing that event," said Leila Mays, a space weather scientist at NASA's Goddard Space Flight Center in Greenbelt, Maryland. Last year, a strong solar energetic particle event was observed by multiple NASA missions. The results, which record the first particle event seen at ground level on both Mars and Earth, were recently published in the journal Space Weather. In this event, high-energy particles accelerated by an intensive shock driven by a coronal mass ejection—a violent blast on the solar surface that spews out gas and energetic particles—were first detected as they left the sun with SDO. The scientists used ground-based instruments and models to track how material moved through the heliosphere and to measure their intensity upon reaching Earth and Mars. Such multi-point observations are essential in understanding how particles blasted off the sun travel through the solar system. This knowledge of how radiation spreads ultimately helps improve models—giving astronauts more advanced warning of potentially dangerous space weather events. "Although this is the biggest solar energetic particle event we've observed on the surface of Mars, it would not have been hazardous for astronauts there," said Guo, who authored the paper. "However, much larger solar energetic particle events are possible and this event helps us understand what that might look like." Scientists will continue to study space weather from Earth with ground-based instruments as well as NASA's heliophysics fleet of spacecraft, but future missions will provide new viewpoints. "Ultimately, more data is needed and we're hoping to get some from Parker Solar Probe, since it's going so close to the sun, where these harmful particles are accelerated to high energies," Mays said. "We have assumptions of how this acceleration works that go into the models, but measurements from Parker would really help improve our theories." Already, the Radiation Assessment Detector Instrument aboard the Curiosity Rover has been measuring high-energy radiation on the Martian surface—data that is helping scientists understand how much radiation humans will be exposed to when visiting the red planet. NASA and NOAA's joint Geostationary Operational Environmental Satellite Program has been measuring energetic particle measurements for current astronauts since the 1980s. Instruments to study particle radiation will also be aboard future flights and the Lunar Orbital Platform-Gateway, the proposed outpost to orbit the moon. "Future deep-space human exploration vehicles provide not only the ability to safeguard the crew onboard, but simultaneously do new scientific experiments," said Antti Pulkkinen, scientist at NASA's Goddard Space Flight Center. "They will serve this dual purpose." These measurements will benefit more than just space weather forecasting. They will also help us understand things closer to home—like the moon. Returning to the moon will undoubtedly unlock new doors to understanding our nearest neighbor in space. After all, it wasn't until we first stepped foot on the moon that we were able to understand its origins. Today we are still discovering new things and NASA missions like the Acceleration, Reconnection, Turbulence, and Electrodynamics of moon's Interaction with the sun—ARTEMIS—are uncovering new insights into the moon's tenuous atmosphere. The moon is, in fact, not airless. It has a thin atmospheric layer—the exosphere—composed mainly of hydrogen, helium, neon and argon, extends about a hundred miles above the surface. Mixed on the upper edge of the exosphere is a tenuous and ephemeral secondary layer—the ionosphere—created by sunlight energizing atoms in the exosphere. "The ionosphere is a million times less dense than the ionosphere of Earth so it's really hard to directly measure those charged particles," said Jasper Halekas, ARTEMIS scientist at the University of Iowa in Iowa City, and lead author on a new study of the moon's ionosphere. Using a new technique to analyze data from ARTEMIS, Halekas and his team were able to measure the ionosphere directly. They noted the ionosphere enlarged every full moon and became coupled with Earth's ionosphere—meaning charged particles are likely able to travel back and forth between the two bodies' ionospheres. "The presence of the moon may actually affect Earth's magnetosphere," Halekas said. "It might actually perturb that local environment." 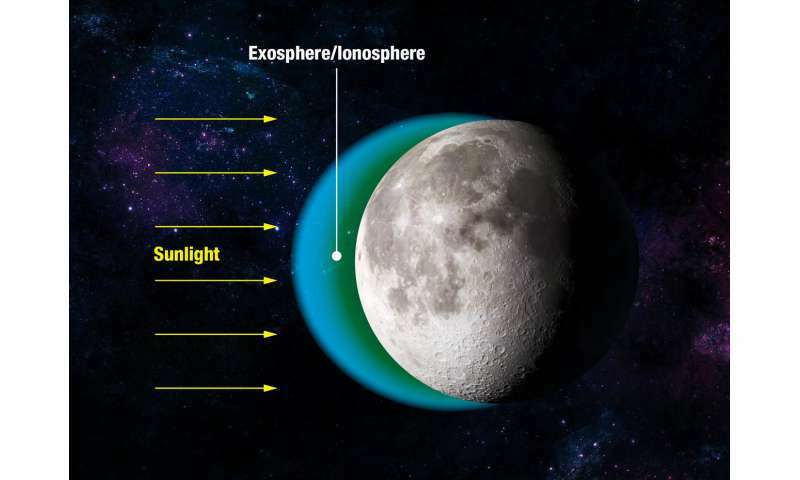 New missions to the moon would allow the study of the ionosphere and exosphere from the surface, giving us a better understanding of that coupling and how our atmosphere may be linked with the moon's. The new results might also help us better understand how atmospheres are created and sustained on small bodies. "The same technique could be applied to lots of other bodies in the solar system, which should have a tenuous atmosphere like the moon's," Halekas said. "This would include: moons around the outer planets, big bodies in the asteroid belt, things in the Kuiper belt, and even objects outside the solar system." It is hard to foretell the discoveries that will be made as humankind voyages to the moon and Mars, though certainly they will be innumerable. What is certain is the starring role heliophysics will play in helping us get there. Studying heliophysics and space weather are invaluable to protecting our astronauts and assets in space. And, undoubtedly, this journey across the solar system will help us uncover new discoveries about the heliosphere we call home, making the roads of space safer for future generations of space explorers. Wow look at all that electromagnetic plasma. Hey EU people - how would you protect astronauts from all that EU stuff that they would allegedly be exposed to? More plasma? Antiplasma? The only absolute certainty is? It won't be any technology they are competent to invent! Just equip the vehicle and Mars base with a magnetic shield (emulating the earth magnetic field) and be done with it. ahh, free, the devil is in the details! How specifically would you generate a magnetic field strong enough to protect the vehicle? How much does that extra gear weigh at launch? What is powering the mag-field? How much weight does that add to the total? By the way, just one niggling little trivial detail? The strength of the Mag-field needed against Solar & Cosmic radiation? How will you protect the tech & astronauts inboard of the vehicle from the damaging effects? The only way I know of, with our present level of technology? Is to wrap the astronaut habitat & critical systems with gold-foil. Then of course we wouldn't need the mag-field, would we? Now, if you are an experienced engineer & have physical, working solutions to these vital problems? I hope you aren't making Arthur C, Clarke's mistake? Failing to file for the patents? I mean, the glory is all nice. But "glory" don't pay your bills!